High ionic conductivity, satisfactory mechanical properties, and wide electrochemical windows are crucial factors for composite electrolytes employed in solid-state lithium-ion batteries (SSLIBs). Based on these considerations, we fabricate Mg2B2O5 nanowire enabled poly(ethylene oxide) (PEO)-based solid-state electrolytes (SSEs). Notably, these SSEs have enhanced ionic conductivity and a large electrochemical window. 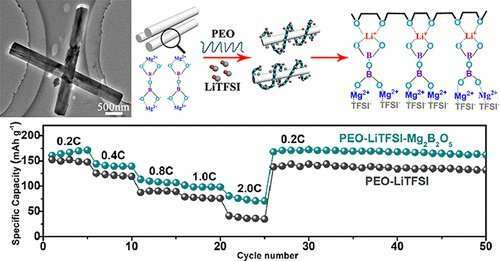 The elevated ionic conductivity is attributed to the improved motion of PEO chains and the increased Li migrating pathway on the interface between Mg2B2O5 and PEO-LiTFSI. Moreover, the interaction between Mg2B2O5 and −SO2− in TFSI– anions could also benefit the improvement of conductivity. In addition, the SSEs containing Mg2B2O5 nanowires exhibit improved the mechanical properties and flame-retardant performance, which are all superior to the pristine PEO-LiTFSI electrolyte. When these multifunctional SSEs are paired with LiFePO4 cathodes and lithium metal anodes, the SSLIBs show better rate performance and higher cyclic capacity of 150, 106, and 50 mAh g–1 under 0.2 C at 50, 40, and 30 °C. This strategy of employing Mg2B2O5 nanowires provides the design guidelines of assembling multifunctional SSLIBs with high ionic conductivity, excellent mechanical properties, and flame-retardant performance at the same time.